When our guests come to stay at the Langstone Cliff, they often make essential day trips to some of Devon’s most incredible ruins as part of their South Devon holidays. The county is prized with impressive history and landmarks perfect for both family days out with the kids or to explore as a couple. We thought it would be handy to pull together all the castles in South Devon and put them all in one place for all our guests to know about and even venture out to visit. We’ve included the distance in miles from the hotel and how long it takes by car to get there as a helping hand. This little gem, hidden away amongst deep wooded valleys is Berry Pomeroy Castle. While the castles historic ruins are a great way to entertain the kids, Pomeroy also makes for the perfect romantic ruin which with ample history to keep boredom at bay. Plans by the Seymours to build a grand Elizabethan mansion we’re once in the pipeline. Set to become as grand and spectacular as Longleat House, the mansion was never completed and left for ruin by 1700. The Pomeroy’s 15th-century defences surround the family castle and have become a landmark and a home to some gruesome blood-curdling horror stories. Rumour has it that there have been various sightings during the daytime of ghosts and spirits which linger in the grounds. On the other hand, surrounded by gorgeous woodlands and scenic views, the castle serves as a great location for walkers. The castle is open all year round from Wednesday to Sunday. You can get fully involved with an audio tour that really brings the castle back to life. Powderham Castle is a truly unique and stunning landscape, set amongst an ancient deer park a stone’s throw from the Exe estuary on the south side of Exeter. The castle boasts over 600 years of interesting history which can be revealed from behind the landmarks ancient walls which is also renowned for being one of Devon’s oldest family homes. The castle has been a part of the Courtenay family since 1391 when building first started and is still a part of the same family today. The property has more recently become home to the new Earl and Countess of Devon (which are the 28th generation to call the castle home). It antique and historical décor are fascinating to see and make for a nice way to spend an afternoon. Of all four castles in South Devon, Totnes Castle is the one to head to if you’re looking for a memorable view to take home with you. With its stone shell-keep standing high up over the Saxon town of Totnes, you can appreciate views over the river Dart. Once you get to the top of the historic stone structure, families and couples alike can indulge in the perfect picnic or bask in all the glory of its tranquil and peaceful surrounds. The castle is a great place to venture out to on a bright and sunny day in the summer or springtime and both Dartmouth and Berry Pomeroy Castles only a short drive away. Some key things to try and do when you’re there include their archaeologist ‘Ivor S.Hovell’ and ‘Family Activity Pack’ and check out the ‘graffiti’ on the trees, created by prisoners held captive at Totnes during the Second World War. 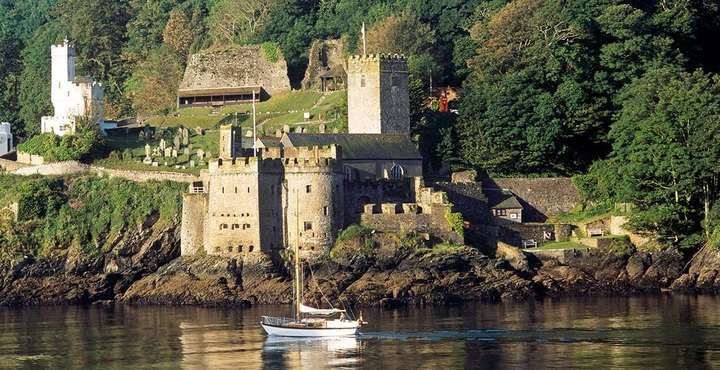 Dartmouth Castle is nationally recognised as one of the most stunning fortresses in the UK. With over 600 years of outstanding history to marvel over, the castle stands proudly at the entrance of the Dart Estuary and the thriving port of Dartmouth. Likewise, this means it boasts flawless views on bright and clear days over the estuary and right out into the big blue sea. The castles ‘gun tower’ played a heroic part in its wartime history to mount ‘ship-sinking’ heavy cannons. If you’re full of life, climb right up to the top not only can you take advantage of the breath-taking views over the estuary. The castle also plays home to the fine Church of St Petrox as well as a tonne of exciting artefacts to cypher through and absorb into your brains history books. The kids will also enjoy the boat trip from the town to the castle and Mum and Dad can look forward to a glass of prosecco and a pint in the riverside tea room. For those walkers who love a coastal or woodland walk, you can venture out to spot wildlife and birds aplenty. With most of South Devon’s ancient ruins only a short car journey away, we like to think our home-from-home hotel makes a great place to rest up either side of your explorations. As one of the leading family hotels in Devon we offer a great variety of accommodation in South Devon. If you’d like us to book tickets or more information on the castles, give us a call on +44 (0) 1626 221329 or email us via reception@langstone-hotel.co.uk. Devon is a perpetual go to for a lovely family getaway all year round. The beautiful beaches are a constant pull for families from across the country, but there’s more to South Devon than just the beach!